The VIX did after all, drop hard to hit the daily SMA 200 (chart below). We had been allowing for and even expecting that possibility. The point being a question: How much lower can the VIX go while the bulls rally? 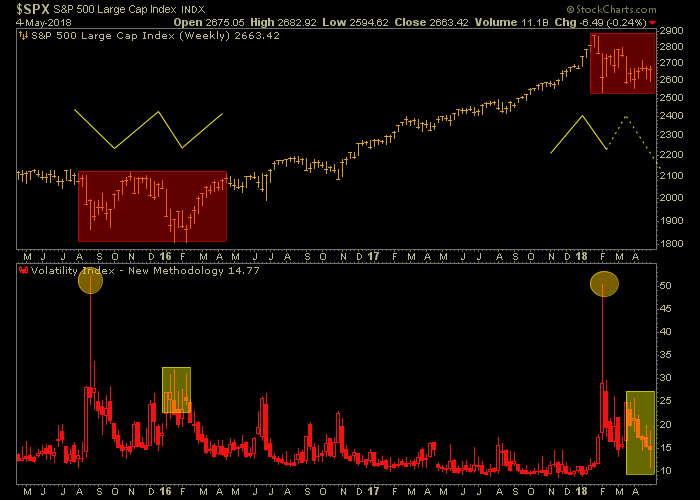 Anything can happen short-term but this lack of anxiety as expressed in the VIX is not bullish for the stock market. Indeed, it sends my thoughts to bear markets past, when these wondrous rallies would take place, killing the shorts for a day or two but actually helping to slowly boil the bullish frogs floating in the pot. This is not yet a confirmed bear market but this is behavior reminiscent of the 2000-2002 bear market. I remember it clearly. It was manageable and tradable, unlike the thing in 2nd half 2008. Let’s look at it from another angle; namely the entire SPX/VIX relationship from the late January blow off on. Up is now shown as down on the SPX to match it with its running mate, the VIX. SPX topped on January 26 and its inverse tracked the VIX very well during rallies and declines until late March when the VIX began easing off track. This plays into the boiling frogs analogy. When the correction erupted out of nowhere* in February investor alarm erupted right with it and drove the VIX proportionally. But since that 1st shot across the bow investor behavior has settled down even though stocks are much closer to the February lows than the January highs. The frogs are content with the situation they are in right now. * Well, it actually came out of somewhere; namely a manic mini-blow off amid rabidly over bullish sentiment and epic entry into the market by new investors chasing the Trump reflation bull (recall the record openings of new discount broker accounts in Q4 2017). Next Next post: Which Hunt?